Announced a couple of weeks ago, the superyacht Aurora was launched on 22 June at Tecnomar. The Italian shipyard is proud to launch this new motor yacht from their Nadara 30 series. Built in GRP, Aurora has an exceptional interior space for a yacht of 30m. Entirely designed by the in-house team, her interior layout accommodates 10 guests in five staterooms on the lower deck: a full-beam master suite, two double and two twin cabins. Her exterior design show good ideas in action like large windows and portholes bringing a lot of natural light inside. A Jacuzzi is astutely incorporated in the foredeck, and the large dining area can be converted into a solarium. On the technical side, twin 1,825hp Caterpillar engines give a top speed of 26 knots and a cruising speed of 22 knots. Aurora is the second Tecnomar launch this year. 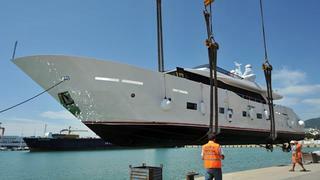 She will be delivered soon, a few weeks after the delivery of the 36m Double Shot. Note also that Aurora is offered for sale as recently reported in our brokerage news.